Cedarbrae residents are actively engaged in their community and keeping them informed is our top-priority. 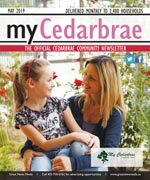 MyCedarbrae is the official community newsletter, and covers community news and is published monthly to keep content current and relevant. Delivered to every household, apartment, and business, every resident is acquainted with the community’s most important information. Cedarbrae is home to a very active community association. Numerous groups and activities, including Boy Scouts, Girl Guides, karate, the Sword Academy, yoga, Moms & Tots and Jelly Bean Dances take place within the recreation center. The community is also known for its sports programs, notably soccer and football, which are played on the community field. The community association also hosts numerous other activities such as a craft fair in November, the Stampede Hoedown in July and the New Year's Eve Wingding. These activities enable the resident's of Cedarbrae to maintain a strong sense of community. In the City of Calgary's 2012 municipal census, Cedarbrae had a population of 6,237 living in 2,609 dwellings, a -0.4% increase from its 2011 population of 6,264. With a land area of 2.1 km2 (0.81 sq mi), it had a population density of 2,970/km2 (7,690/sq mi) in 2012. Residents in this community had a median household income of $62,063 in 2000, and there were 11.8% low income residents living in the neighborhood. As of 2000, 21.4% of the residents were immigrants. A proportion of 10.5% of the buildings were condominiums or apartments, and 22.7% of the housing was used for renting. For more detailed info visit the City of Calgary community profiles site.